The holiday cottage of "Wychwood" can be found on the Isle of Wight. This cottage sleeps 12 people, so is a good choice for those looking to get away with friends or family. There are 5 bedrooms at Wychwood - 3 doubles and 2 twin bedrooms. Both the twin bedrooms have a single bed in too - so Wychwood sleeps 12 people. Wychwood is also pet friendly. An ideal destination to take a break at any time of the year, Wychwood has an open fire in the dining room - the perfect place to spend a winter's evening. Or make use of the gardens during the summer months - with a front garden have a terrace area; and the enclosed back garden having a patio and sitting out area too. The beach is only ¼ mile from Wychwood - so perfect for an early morning swim to bed the blood pumping! Should you fancy a swim, but don't want to brave the sea, you even get a private indoor heated swimming pool at Wychwood. Wi-Fi is available at Wychwood, so you can stay connected to the internet; with a TV, DVD and CD player also available. Bed linen and towels are all included in your holiday. There's a washing machine, tumble dryer and dish washer too - to help with household jobs which still need to be undertaken, even on holiday. You may want to leave the peace and quiet of your holiday accommodation, and venture out to see what's going on in the area. 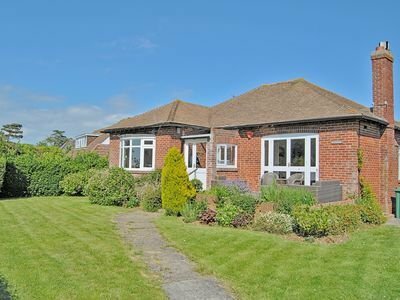 You have towns such as Freshwater, Lymington, New Milton, Brockenhurst, Christchurch and Cowes all nearby. You could also visit Yarmouth Castle, Braxton Gardens, Tennyson Monument or Fort Victoria Marine Aquarium. And "Blackgang Chine" is always a winner when you've got children along for the ride. Your holiday Wychwood start's on a Friday. Should Wychwood not be to your liking, but you fancy staying in the area around Yarmouth, you might well be interested in the cottages below. All these cottages are within a few miles of Wychwood.